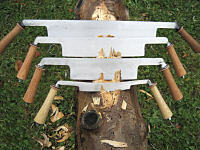 Drawn from the century-old tool designs, these Small, Medium, and Large Draw Knives are designed for the peeling of logs with a maximum amount of control. They are used with the beveled side down. The handles are bent to approximately 20 degrees making this a very comfortable knife to use. Hand forged from tough wear-resistant steel. We have some similar two-handed tools worth checking out. Scorp - also known as a gouge knife, this tool is extremely useful in cleaning out and finishing lateral notches in logs, to the scribe line. It comes sharpened on front and back edge to facilitate cutting on the push stroke where the wood grain runs across the scribe line (knots!) 2-1/2" U-shaped cutting edge with the same drop, 24" handle spread. 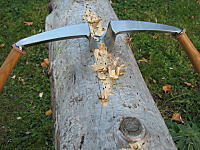 Montana Hewing Knife - is worked like a draw knife, acts like a adze, just 5-times faster. Clean up old logs or create the hewn look of the past. The Small Scandinavian Draw Knife has a hand forged, wedge-shaped edge for maximum control, and it enables you to take a nice cut without the blade digging in. 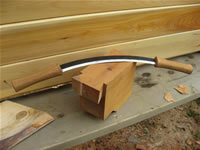 Great for smaller logs and railings, etc. A fun knife to use with a comfortable, ergonomic grip. Tip guards and holsters — Protect your investment with a high-quality, handcrafted leather guard made of saddle-grade leather which is stitched and riveted. 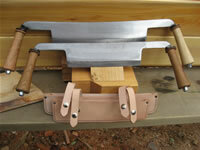 Available for framing and bench chisels, slicks and draw knives. Our Belgian Hone™ sharpening stones will keep your tools in top shape.